It’s Monday! What are you Reading? is a meme hosted by Kathryn at Book Date. It is a great way to recap what you read and/or reviewed the previous week and to plan out your reading and reviews for the upcoming week. It’s also a great chance to see what others are reading right now…you just might discover your next “must-read” book! 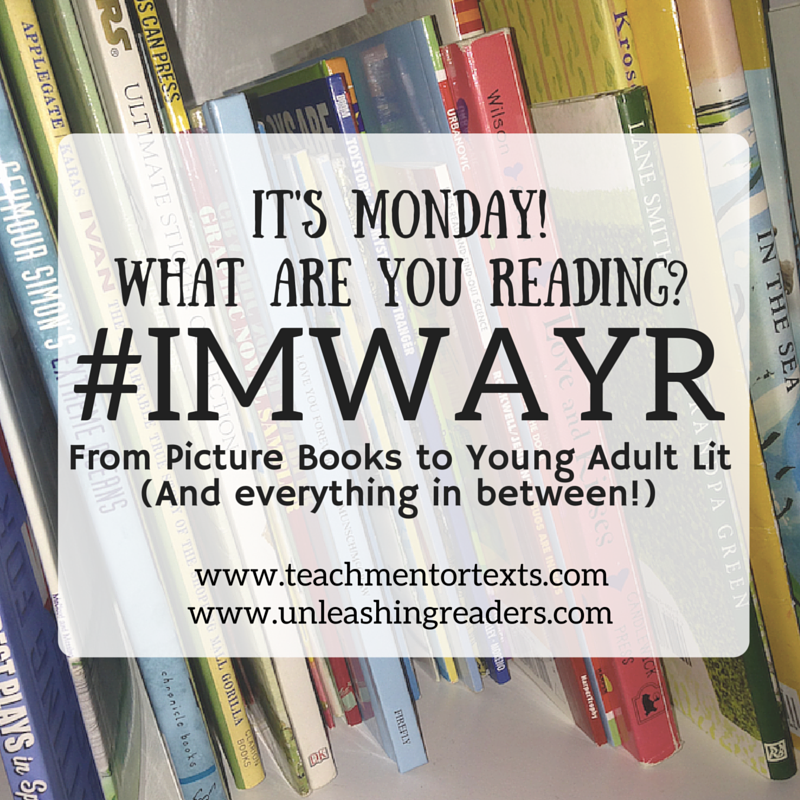 Jen Vincent (stole the above paragraph from her) at Teach Mentor Texts rounds up the kidlit version of IMWAYR each week. I think. I see the posts around but don’t participate, generally. But I might try to hop in occasionally in 2017. The book I loved most this past week was Ms. Bixby’s Last Day. As this book neared its end, I was sad for so many reasons. The hardships that the three boys faced, the illness of their beloved teacher, their struggle to tell her what she meant to them, and the fact that the book was ending soon, and I was worried about all of them. This is just a beautiful book. I smiled, cried, chuckled, cried, laughed, cried. I felt uplifted at the reminder of the power of one person to impact another person’s life. Educators have the opportunity to change kids’ lives every single day. And they do. And the special ones change the world in a kind of ripple effect. I grew to love Steve, Brand, Topher, and Ms. Bixby. If I had stayed in the classroom, I hope I would have grown up to be Ms. Bixby. My only quibble was that, in the audiobook version, at least, it took me awhile to figure out who was speaking when. With three first-person narrators, it can be tough. They do have distinct voices on the page and very different personalities and problems. But I’m a person who has troubles keeping characters straight, and with three 6th-grade boys taking turns narrating, I did have to consciously listen for clues sometimes and remind myself of which one was talking. But that was minor. This book was major. It touched me in a way that not many books do. And as I finished listening to it on inauguration day, it was a much needed reminder of the power of kindness, of empathy, of vulnerability, and of courage. This book has made it around my classroom. The voices are very believable and accessible to kids. Even though the topic is sad, I think the humor with the antics of the boys makes it a fun read.